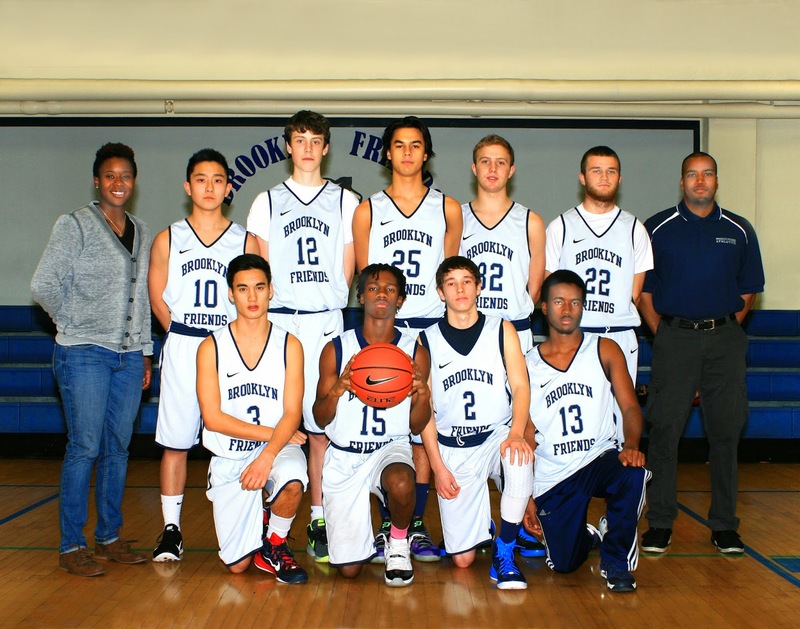 The Brooklyn Friends varsity basketball team entered the 2014-15 season entering a new league with renewed expectations. After losing two valuable senior starters the previous year, the team needed the underclassmen to step up and help improve the team. This year’s team featured three seniors, four juniors, and three sophomores that rounded out this talented squad. The team was led by junior guard Quran D. who averaged 19.6 points, 6.0 assists, and 5.3 steals per game. The do-everything guard led the team and played hard on both ends. The 2nd leading scorer was sophomore guard Brendan G. with 10.5 points a game. Junior forward Chris B. averaged 9.1 points and 9.5 rebounds a game. Senior co-captain (along with Quran) Adam W. averaged 8.4 points and 7.9 rebounds per game. Two vital seniors in Lucas M., and Jumoke greatly improved the team with their team play on both ends. Lucas started to pick up the scoring in 2015, showing the ability to make the 15 foot jumper as he averaged 6.0 points and 4.5 rebounds in February. Phil C. made important improvements from last year to this year increasing his scoring/rebounding averages while extending his shooting range to the three point line. Tyler V., played his first year in the varsity level improving the roster with his ability to hit three pointers and hustle on defense. Charlie S., another talented sophomore along with Phil, started to come along towards the end of the season especially in February, as in that month he averaged 12.5 points and 11.3 rebounds. To start the season, the blue panthers won the LREI tournament in convincing fashion beating the tourney host by 25 points then advancing to the championship game and beating Browning by 50 points. Against non-league opponents, the Panthers had have some success during the season including beating rivals St. Ann’s School twice. In the ISAL league, the panthers started out with a 9-1 record which was tied for 1st place and made the playoffs as one of the league’s top 4 teams. Although losing in the playoffs to the eventual champions in the semifinals in Churchill. The future of this team looks to be very bright! The Boys JV Basketball had a great season compared to last years season. last year the team went 2-10 in league play and was eliminated in the first round, but this year the panthers flip their league play to 10-2 finishing with a first place banner and making it the the championship game. even though the panthers were unsuccessful in the championship game they showed they have heart and can compete with the best of the them, next year the panthers will definitely be a team to look out for. as for the panthers journey to the post season it was a great ride. the season started off with the panthers winning the LREI tournament and bringing home the trophy, that win would propel the panthers into a 5 game winning streak. the panthers would lose their first game on the road against St. Ann’s in a contest that came down to the wire. the panthers would win their next game followed by a 3 game losing streak, then a 5 game winning streak, followed by a two game losing streak, and would close the season with a 4 game winning streak into the post season. talk about a up and down season, but the coaches couldnt have been any more proud of their players because no matter what the situation was these guys would fight to the end, and thats all you can ask for. Congrats to all the players. 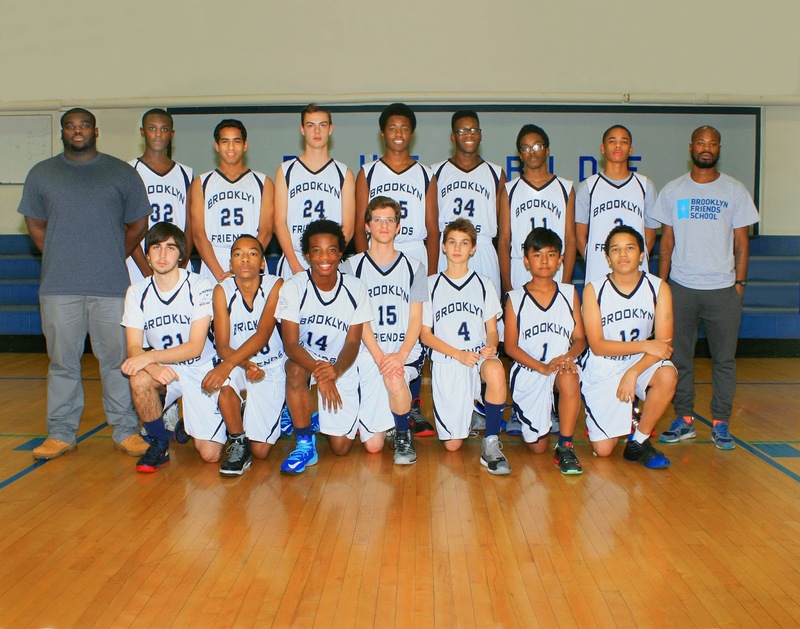 The 2014/15 MS Boys Basketball team could have felt sorry for themselves. They could have been upset that their 8th grade leader was called up to play on the JV team. It would have been a simple thing. But they did anything but. They took it as an opportunity to play as a team united and prove themselves. That is exactly what they did. With three returning starters returning from a year ago and a large group of talented and dedicated 7th graders, the team compiled a 10-6 record. The team was in every game having never lost by more then 7 points. The signature win came at home against Dwight as they came from behind in the fourth quarter to win the contest by two on a last second buzzer beater. The team was lead offensively and defensively by the Dynamic Duo of Kwesi CS Luca J. The Duo combined for almost half of the team’s total offense and for over 70 percent of the teams rebounds. Having only played the latter half of his seventh grade season, Kwesi really came to play right from the start of his eighth-grade year. He led the team in scoring, blocked shots, rebounds and steals. As you might imagine he also lead the team in Double-Doubles. His best game of the year came at home against LREI when he had season highs of 26 points, 26 rebounds and 7 blocked shots. Along with the leadership of the 8th graders, there was the emergence of a few key seventh graders. None more exciting then Lewis W. Lewis started the season as a part time player on a very large roster but began to separate himself with confident and poised play as well as clutch shooting. Lewis was not only made a roster regular by mid season but was named a starter as well. 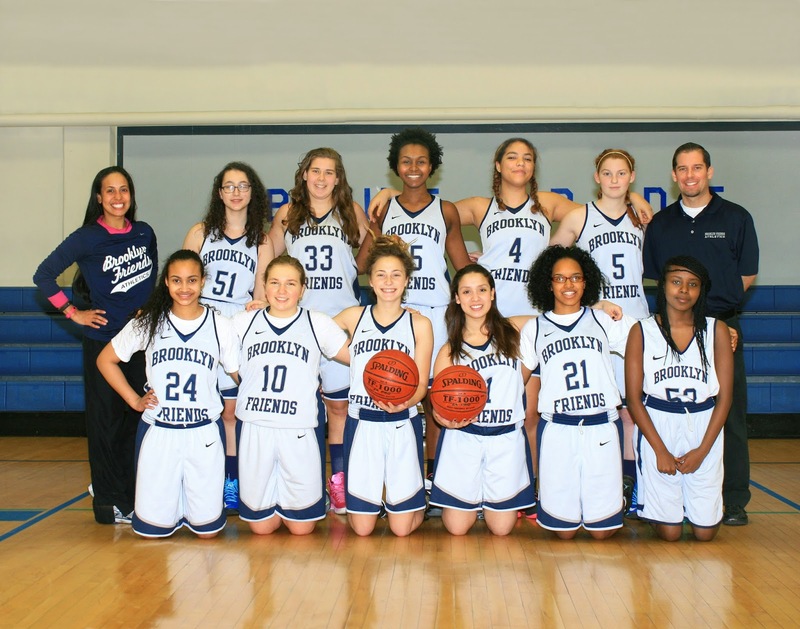 The Brooklyn Friends Girls Varsity basketball team had another successful season. Still in a rebuilding mode the team which returned six players from the previous season had to make numerous changes and adjustments this season. The good news was that junior Charlotte S. and sophomore Silvely A. showed up at the schools door step for this seasons campaign. They both stepped right in and joined the starting five. The team had three core veteran seniors Julia B., Maret S-M, and Julia C. who all contributed to this seasons success. Other newcomers to the team were junior Xiana Q. and sophomore Fatima E-B, as well as freshman Manya C. Rounding out the team were key returning juniors Abby M. and Sierra V., as well as fellow junior Taty R., and sophomore Monet M. What a great group. This years team did such a great job across the board. The worked, improved, competed, and battled all season as they came in second place in the their division and made it back into the playoffs coming up just short in the semifinals. The Panthers started their 2014-15 campaign off with a tough loss to local rival Packer. Then they picked up their first win of the season with a nice win against fellow local rival St. Ann’s. It was BFS’ first ACIS league win in awhile as the team rejoined that league this year. Then it was onto their first game at St. Francis College were they came up just short losing by two points to ACIS opponent Berkeley Carroll. The teams positive energy and willingness to learn indicated the potential for a solid season lay ahead. The seniors were expected to anchor the team as captains Julia B. and Maret S-M brought along much needed experience and a solid foundation, along with fellow senior Julia C. who fully joined up after her November school production. BFS rattled off five consecutive ISAL league wins including a very exciting road win versus Churchill 35-32 before heading into the winter break to heading into the the time off with an impressive undefeated ISAL record. BFS rambled off three more ISAL league wins after the break to improve to 8-0 in the league before its showdown with fellow undefeated ISAL opponent LREI. The team ran into some trouble and picked up their first ISAL league loss of the season. BFS continued to compete in both the ACIS and the ISAL league. During the season the coaches really enjoyed working with this team and all of its players. This was truly a great group and a real pleasure to coach. BFS was a team to be reckoned with in the ISAL as they geared up for the playoff run. The team defeated Garden school on the road during their final regular season game and their three seniors were recognized for their contributions to the program. During the regular season (12-9) the team made numerous adjustments as it was getting to know its new players, as well as dealing with multiple issues including injuries and players availability, etc. BFS geared up for its playoff run getting in a few more practices and tweaking its plays. As always we were hoping for the best. These are truly student-athletes. Our ACIS semifinal game versus Lehman Prep fell on a Tuesday and all of our juniors had a SAT Prep Course to take and a few other girls were injured or under the weather so we came up short. For our ISAL semifinal game we were matched up against Birch Wathen Lenox who we defeated by three points 34-31 a month earlier on the road. This time we were playing them on a college court just over the bridge. The team was almost back at full strength but a few players had to meet us at the venue due to academic commitments and our teams leading scorer Julia B. had been out sick the previous two days. Due to the size of the court and Julia B.’s health she could only play in three minute spurts here and there. The team came out strong as w took a nice early lead. But we let BWL back in the game and hit a wall on the offensive end as we had trouble scoring during the second and third quarters. It didn’t help that some of the calls didn’t go our way and a couple of our players who never foul out now suddenly were picking up foul that had not been called all season and eventually fouled out. The team came up short that day. The coach lost some sleep. But all and all it was another great season and a wonderful learning experience for all involved. It was nice to be back in the playoffs. The BFS Girls showed a lot of grit and determination battling throughout the long season. Their love, friendship and support for each other showed in each game and each and every practice. It was once again a real special team and a truly enjoyable experience to be a part of for all involved. And that is what it is all about. Blue Pride!! BFS loses some fine student athletes to graduation this year. We had the pleasure to nurture their athletic talents this year and to see them grow both on and off the court. We hope they can use their newly learned and enhanced skills in their future collegiate environment. 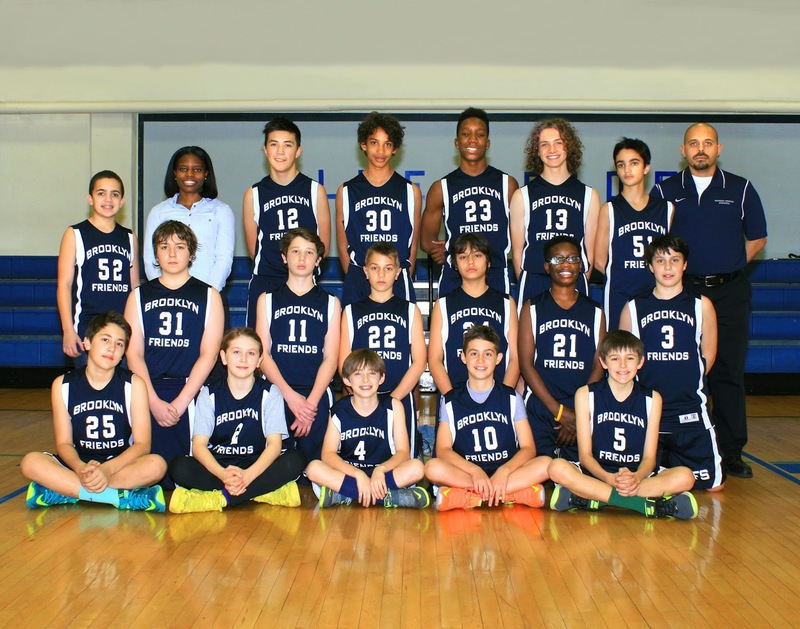 The team finished with a winning record, 12-11 overall and 10-3 in ISAL league play and 2-2 in ACIS league play. Congrats to all our players, especially seniors Julia B. (527 career points), Maret S-M., and Julia C., we have truly enjoyed coaching you girls over the years. Thanks to our juniors Abby M., Sierra V., Taty R., Xiana Q., Charlotte S., and our sophomores Ivy L., Monet M.,Fatima E-L., and Silvely A., and our freshman Manya C. Thanks also goes out to our team managers. See you back on the court next season. Blue Pride Runs Deep, Friends Forever, Blue Pride!! 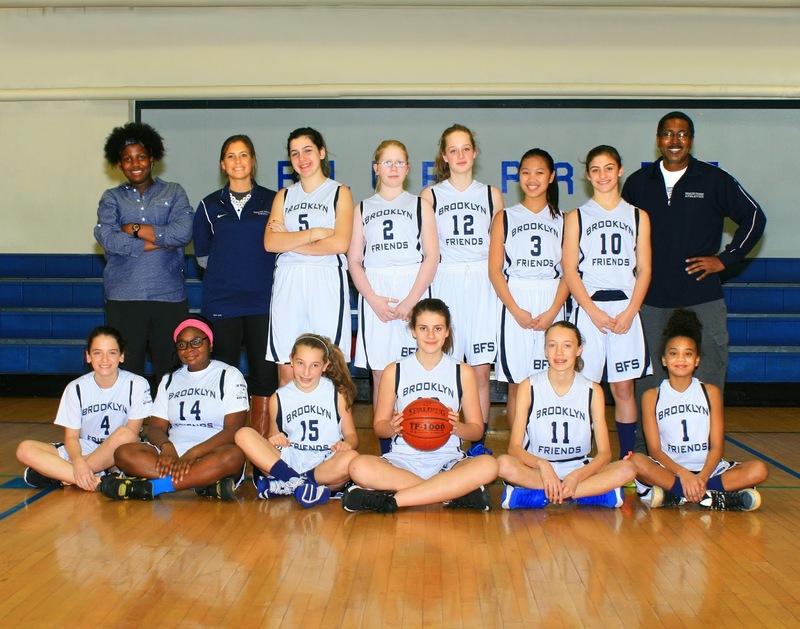 The Middle School Girls Basketball Team had a fun and successful season. The MS girls brought so much enthusiasm, questions, and raw athletic ability that all we could see was a promise for a successful season. The willingness to learn new skills, and build on learned skills they already had was amazing. They quickly showed others what to expect from them, there would be no cakewalk for any opponent. Blessed with the talent of Devon O. leading a team of excited players, we were able to develop a solid defense that lead to a quick paced score that the defense also help maintain to win 9 of 14 games. There was not one player who did not take time to learn and bolster a tough defensive set, often time pressing opponent guards into turnovers or the forwards battling for rebounds to maintain ball possession for us. The play from 1 to 11 was impressive, the development of Salma M. into a force defensively in the paint, and her ability to run the floor and receive long passes from Devon O. Hannah S. the back up center, new to the game, but looking to contribute, played as if she was born to be a basketball player. The forward play from Libby S., Jessie R., Olufunke S.,Nora S. was shut down great, rebounding and astounding. The unexpected bonus from Kaley B. who originally would play the 2 position had to step in due to an injury to Nora S., and Kaley became a rebounder and tough defender in the front court wrecking the plans of the opponents. In the backcourt, we were fortunate to have a talented guard with great determination, because of her talent/ability we were able to work on the development of the other players. Devon O. often repaired errors on the floor with her knowledge and athletic ability. This allowed us to help improve the games of Kennedy W., Ruthie L. & Willa S. the young 7th graders that we will lean on next season. Devon’s relentless pursuit made this season easier to coach, when other teams focused on her the other players stepped up to give her help, really impressed with the camaraderie the players exhibited through out the season. Special thanks to Jineen for working as team manager. The players have all of my & Asst. Coach Clinchy’s respect and admiration, great job MS Girls. Winter Track had a season of improvements. The students that committed to coming to practices this season drastically saw improvements in their running times. Maya K. and Maya B. saw huge improvements in speed. Maya K. continued her eagerness to run in completing workouts over weekends. The work definitely paid off as she remains one of our fittest athletes year round. Bella G. learned that she was quite the speedster we knew she always had in her. Aishat A. made huge gains in improving her recovery time between interval workouts and has already set some goals for herself when she returns to running next year during cross country. Some US students like Miles and Emmitt S. occasionally came to practices in between their duties on the Basketball team. It was quite remarkable to see that students are really came to practice with a smile, took time to set personal goals, and were vested in running on their own outside of practice times. What I love about the small group of runners this winter, was that when there were not any conflicts with after school commitments, students were really focused and gave 110% at each practice. Students were encouraging one another and always left the Armory exhausted by happy with the work they put in. 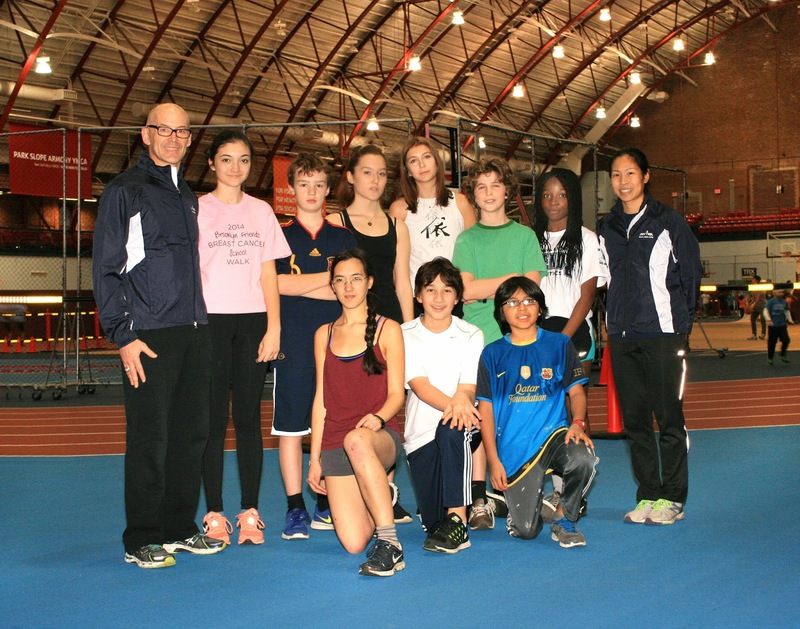 We look forward to seeing many of them join us in Outdoor track. On our MS team, we saw huge commitment to attending practices. There was a lot of team spirit between this group of students. During interval work, students would key off each other and encourage each other. Sidney E., Oscar D., and Ethan L. worked relentlessly hard to improve their interval times at practice. Ethan L. had a great performance in his first meet in the 400m, running faster than the coaches expected. Ella N. continued to build on her speed and ended the season running a personal best in the 200m at practice by about 20 seconds faster than she had been running to start the season.